Ships today if you order in the next 9 hours 31 minutes. No cat owner wants to have to deal with the nasty results of an upset stomach and poor digestion - and your cat doesn't want to suffer through it either. 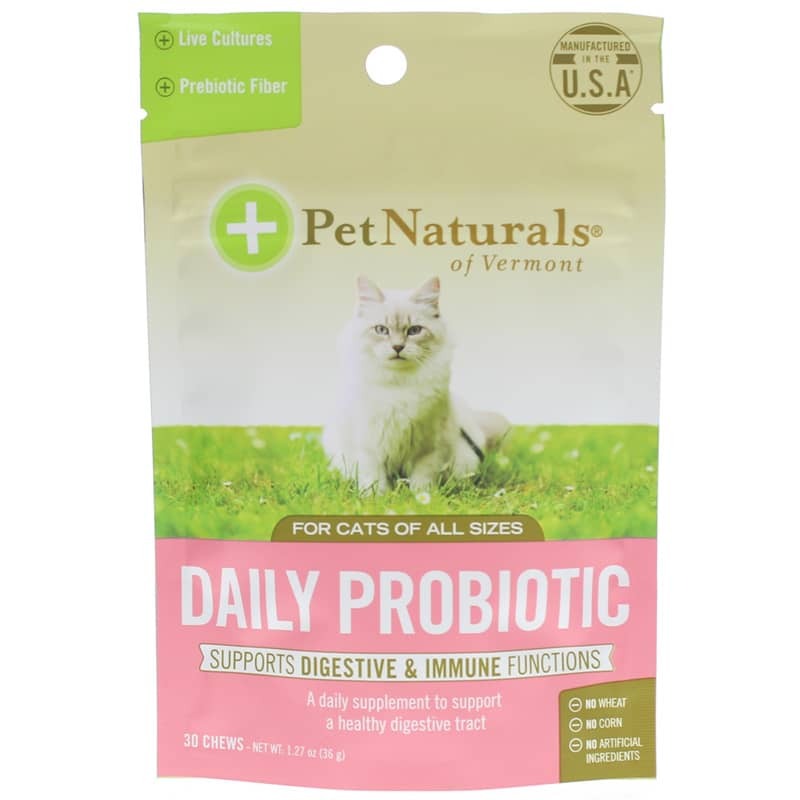 Help keep your feline feelin' fine with Daily Probiotic for Cats from Pet Naturals of Vermont. Daily Probiotic for Cats contains probiotics to support digestion and immune system health for a happy, healthy cat. Just like humans, an imbalance of good and bad bacteria in your cat's gastrointestinal system can cause poor digestion and a host of related problems, including compromised immune function. And just as humans can benefit from probiotics, so can your cat. Meeting the unique needs of a cat's gastrointestinal system, this supplement is made with 100,000,000 CFU/gram bacillus coagulans, an extremely durable probiotic that supports production of a wide spectrum of enzymes while also supporting the body's natural ability to rid itself of hostile bacteria. In addition to helping to control the occurrence of gastrointestinal issues, adding probiotics to your cat's diet may also support optimal nutrient absorption and utilization, for optimal overall health. These chews are perfect for providing extra support for dealing with daily stress like traveling, boarding and visits to the vet. They may be particularly beneficial for cats that regularly experience digestive issues. 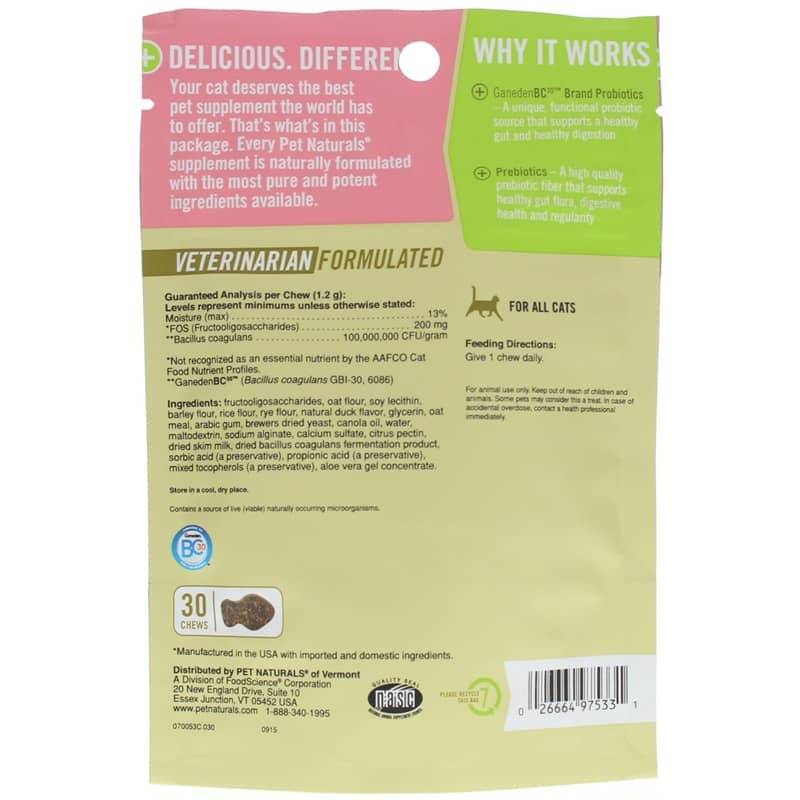 No matter the situation, with natural duck flavor, your cat is sure to love these probiotic chews. Help your cat stay healthy and happy. Order Daily Probiotic for Cats today. Ingredients: fructooligosaccharides, oat flour, soy lecithin, barley flour, rice flour, rye flour, natural duck flavor, glycerin, oat meal, arabic gum, brewers dried yeast, canola oil, water, maltodextrin, sodium alginate, calcium sulfate, citrus pectin, dried skim milk, dried bacillus coagulans fermentation product, sorbic acid (a preservative), propionic acid (a preservative), mixed tocopherols (a preservative), aloe vera gel concentrate. Contains NO: wheat, corn, artificial ingredients. FOR ALL CATS. Give 1 chew daily. For animal use only. Keep out of reach of children and animals. Your pet may consider this a treat. In case of accidental overdose, contact a health professional immediately.